Visit the Nature Centre's Upcoming Events page and ECFNC Activities page for upcoming programs. There is a new domain name for Ojibway's web site. Instead of trying to remember the old URL just tell your friends to enter www.ojibway.ca to reach our site. Friday, June 20: The first fireflies of the summer appeared on June 18, about a week later than normal due to the cool conditions this spring. The first batch of chigger bites was also recorded yesterday. 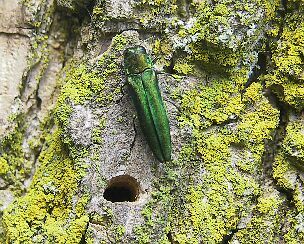 Emerald Ash Borer beetles are emerging from infected ash trees. The above photo shows an adult beetle next to a characteristic "D" shaped emergence hole (click the image to enlarge). Tom Preney and Russ Jones found a pregnant female Massasauga Rattlesnake on June 13. The remarkable thing about this snake was that we had seen this individual being born back in August 1999! Photographs allowed us to identify the snake by her unique pattern of spots. This is the first time that a neonate has later been found as an adult and answered an important question of how long it takes for a massasauga to mature and produce young. Friday, June 6: Many song birds are still migrating through the region due to the cool wet conditions over the past few weeks. Yesterday there was a Northern Waterthrush singing along the ditch by the nature centre. and many Swainson's Thrushes calling overhead at night. This morning there was a singing Mourning Warbler in the backyard. 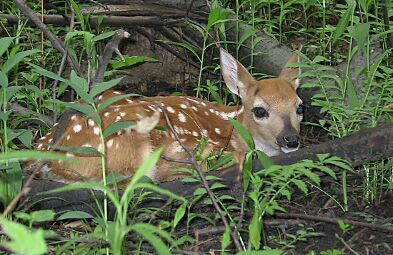 This photo of a White-tailed Deer fawn was taken on the Prairie Path Trail behind the nature centre on June 3 by Tom Preney. Copyright © 2003. All rights reserved. You are on a City of Windsor Web Site.